Cook linguine in a pan of boiling water as per pack instructions. Meanwhile, place bacon rashers under a pre-heated grill and cook for approximately 1- 2 minutes each side. Cut bacon into large pieces. 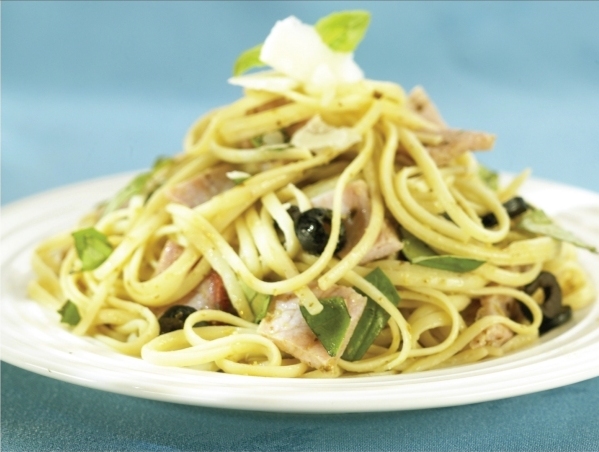 Spoon the pesto onto drained linguine and toss together with the bacon, olives and basil leaves. Garnish with the Parmesan curls and season. Serve the linguine with a large mixed salad.